Shortly before taking a break from writing last Fall, I began digging more deeply into the work of David Rock, who for many years has been exploring the field of neuroscience and its implications for management, coaching, and organizational life. (This resulted in my November 2009 post David Rock on Neuroscience, Coaching and Leadership.) Having begun writing again, I continue to find inspiration in Rock's work. Much of Rock's current thinking is distilled in Managing with the Brain in Mind, published in August 2009 in strategy+business, Booz & Company's quarterly magazine (free registration required) and in "SCARF: A brain-based model for collaborating with and influencing others," a paper originally published in 2008 in Issue #1 of the NeuroLeadership Journal (co-founded by Rock) and available as a PDF on the Resources page of the site promoting Rock's new book, "Your Brain at Work." [T]wo themes are emerging from social neuroscience. 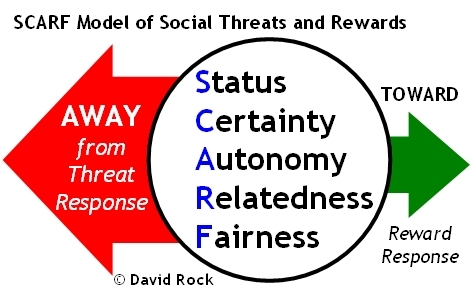 Firstly, that much of our motivation driving social behavior is governed by an overarching organizing principle of minimizing threat and maximizing reward (Gordon, 2000). Secondly, that several domains of social experience draw upon the same brain networks to maximize reward and minimize threat as the brain networks used for primary survival needs (Lieberman and Eisenberger, 2008). In other words, social needs are treated in much the same way in the brain as the need for food and water. Status is "about relative importance, 'pecking order' and seniority," Rock writes in "SCARF..." He cites the work of epidemiologist Michael Marmot, whose research suggests that status is "the most significant determinant of human longevity and health, even when controlling for education and income." Two key aspects of our brain's perception of status are: 1) how easily a threat response can be triggered by such conventional workplace practices as performance reviews and "feedback" conversations, and 2) the fact that threat and reward responses related to changes in status can be triggered "even when the stakes are meaningless," as Rock writes in strategy+business. These dynamics imply not only that extreme care must be taken to conduct reviews and provide feedback in ways designed to boost, rather than threaten, the recipient's status, but also that attention must be paid to all the little, everyday ways in which interpersonal status can be built up and torn down. The importance of certainty can be seen as a result of the brain's effort to conserve energy, which derives from the limited capacity of the prefrontal cortex, the seat of executive function. As I wrote last November, "we resist mental effort around decision-making and impulse control because we're preserving resources in case we need them more urgently in the next moment," and the same dynamic contributes to our resistance to uncertainty. When we're acting with sufficient certainty, our brain senses patterns, successfully predicts next steps, and operates much more efficiently. But when we lack certainty and can't predict what will happen next, "the brain must use dramatically more resources, involving the more energy-intensive prefrontal cortex, to process moment-to-moment experience," as Rock writes in "SCARF..."
That said, it's useful to distinguish mild uncertainty from excessive uncertainty. The former triggers a mild threat response, generating just enough adrenalin and dopamine "to spark curiosity and energize people to solve problems, Rock writes in strategy+business. However, he continues, "when perceived uncertainty gets out of hand, people panic and make bad decisions." Our perception of our ability to exert control over our environment has a substantial effect on our response to stress factors in our life. When we feel more autonomous, we're much more resistant to stress--and when we feel less autonomous, we can perceive the same set of circumstances as much more stressful. Two aspects of autonomy worth nothing are: 1) autonomy and certainty are intertwined--more autonomy yields a greater sense of certainty about the future; and 2) similar to status, "even a subtle perception of autonomy can help," Rock writes in "SCARF..." suggesting that even where autonomy is substantially limited by organizational constraints, meaningful perceptions of autonomy can be generated by small gestures. "[I]n the brain," Rock writes in strategy+business, "the ability to feel trust and empathy about others is shaped by whether they are perceived to be part of the same social group... When [a] new person is perceived as different, the information travels along neural pathways that are associated with uncomfortable feelings (different from the neural pathways triggered by people who are perceived as similar to oneself.)... Once people begin to make a stronger social connection, their brains begin to secrete a hormone called oxytocin in one another's presence. This chemical, which has been linked with affection, maternal behavior, sexual arousal and generosity, disarms the threat response and further activates the neural networks that permit us to perceive someone as 'just like us.'" So in an interpersonal setting it's important to interact in ways that will surface points of similarity, strengthen social connections and increase a sense of relatedness. From a neuroscientific perspective, this process generates oxytocin, allows our brains to classify the other person as "friend" rather than "foe," and contributes to feelings of trust and empathy. Of course, this begs the question of how to address dimensions of diversity. I'm certainly not suggesting that such differences be ignored, but Rock's theory (and my empirical experience with a wide range of clients and students) implies that differences are much more effectively addressed only after a sense of relatedness has been established. "The perception that an event has been unfair," Rock writes in strategy+business, "generates a strong response in the [brain], stirring hostility and undermining trust... In organizations, the perception of unfairness creates an environment in which trust and collaboration cannot flourish." Rock notes in his "SCARF..." paper that "unfair exchanges generate a strong threat response [that] sometimes includes activation of the insular, a part of the brain involved in intense emotions such as disgust... People who perceive others as unfair don't feel empathy for their pain, and in some instances, will feel rewarded when unfair others are punished." And like status, perceptions of fairness are relative. I'm reminded of a recent experience with some colleagues in which I acted in a manner that I felt was fair and justified, while several others had the opposite perception. At the time I was surprised not only by the difference in our perceptions, but also by the difficulty we experienced in resolving the issue under discussion. However, in hindsight it's easy to see that the relative nature of fairness implied that there was no absolute truth to be discovered, and the logical arguments of either side were bound to be fruitless. It was only after we stopped trying to convince the other side of our rightness and simply accepted our relative perceptions that we made any progress toward resolving our differences. If you are a leader, every action you take and every decision you make either supports or undermines the perceived levels of status, certainty, autonomy, relatedness and fairness in your enterprise. In fact, this is why leading is so difficult. [K]nowing the drivers that can cause a threat response enables people to design interactions to minimize threats. For example, knowing that a lack of autonomy activates a genuine threat response, a leader or educator may consciously avoid micromanaging their employees or students. Secondly, knowing about the drivers that can activate a reward response enables people to motivate others more effectively by tapping into internal rewards, thereby reducing the reliance on external rewards such as money. As I noted last November, I see Rock as a (and perhaps the) leading figure in the process of helping practitioners such as myself understand current neuroscience research and apply its findings responsibly. Rock's SCARF model is a great example of his ability to translate the science into language appropriate for a lay business audience, and I expect to refer to it regularly in my work with coaching clients and MBA students. Many thanks, David. Photo by Andrew Vargas. Yay Flickr and Creative Commons.